The devastated mom asked medical staff to prevent her from going into labour. A Chinese couple were over the moon when they heard they were expecting twins at the beginning of the year, after trying to conceive for 10 years. But their joy was short-lived because they lost one of the twins when the pregnancy reached the 25-week mark. On 28 June, the mother, only identified as Hai, and her husband, both from Shanghai, tragically lost their baby boy and were warned by doctors that their unborn daughter was at risk of dying too. The devastated mom asked medical staff to prevent her from going into labour and spent three days in the hospital’s intensive-care unit. 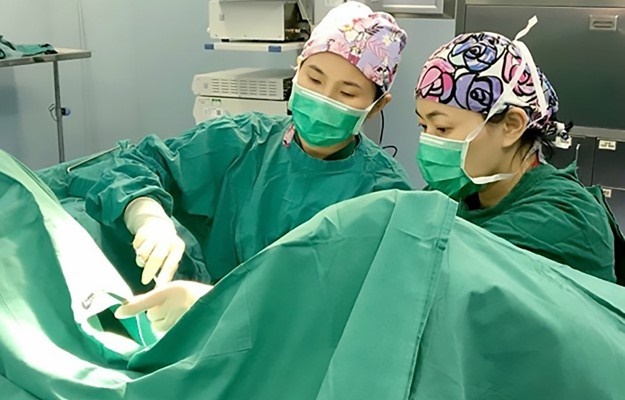 During her daughter’s stay in hospital, Hai’s mom sought expert help and got in touch with obstetrician Liu Ming, who had her transferred to Shanghai First Maternity and Infant Hospital. "She was extremely nervous upon arrival; the dead boy’s placenta was left in her womb,” says Dr Ming. "Meanwhile, the other twin was very likely to come out at any time." After a few tests were performed, doctors discovered the baby girl had a chance of survival, and Dr Ming carried out a rare procedure called a “delayed delivery”, which kept the foetus safe in her mom’s womb for a while longer. Medical staff where hoping Hai, who conceived through IVF treatment, would carry the baby to term but she gave birth to her daughter, nicknamed Mickey, 11 weeks early. Although the little girl was born prematurely, she’s now much stronger and is gaining weight every day. "I had thought I would lose her. She is so precious to me,” says Hai. Little Mickey was treated for pneumonia but she bravely fought the disease and left the hospital in early October. The healthy tot weighed just over 4kg at a recent check-up.